I have been excited about the potential for 3D printing for quite some time. Course completed, I started to think about applications. What can’t you just buy, what makes sense to print? The idea of combining Duplo and Brio seemed like a great idea – I was thinking of an elaborate track with bridges over bridges, and Duplo seemed almost perfect for the job. What I really wanted was a piece with a wooden train (Brio) top, and Duplo bottom. A quick search revealed that I wasn’t the first person to think about this, someone had already designed a Duplo/Brio bridge support system. Looking into this further, and loading these parts into 3D printing software revealed that each segment would take about 2 hours to print – the maximum time allowed on the library’s printer. 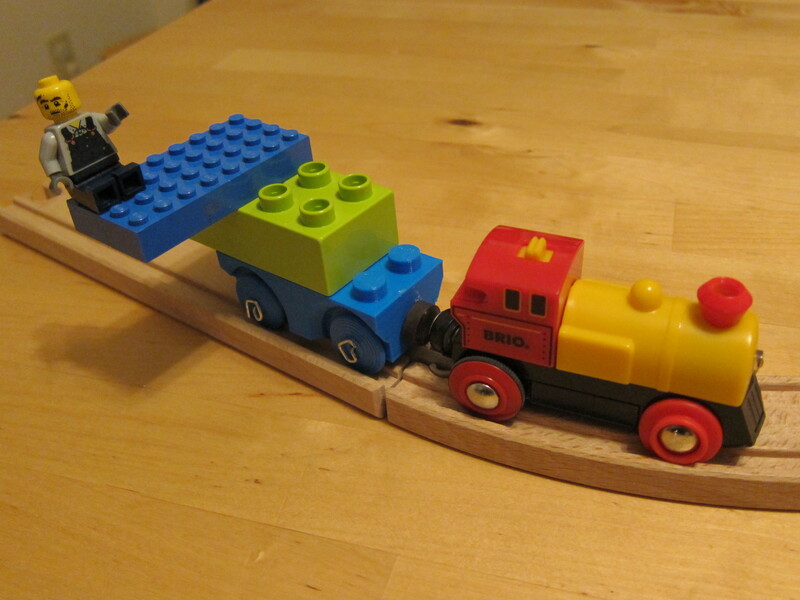 Given that a simple bridge would require at least four segments, I looked for alternate ideas and stumbled across the Duplo/Brio wagon. I downloaded the file, went to the library, and printed it out. 83 minutes later, my train was completed. I attached the wheels to the body with paper clips, and glued fridge magnets to the ends for the couplings. I was quite pleased with the end product (see photo). The library charged just under $5 for the printing time, which is about what a train car costs from a local toy store. Taking this idea further, I thought I may try to design my own toy 3D printed TTC subway or street car for wooden train tracks. I have occasionally seen them available commercially, but they are generally hard to come by.